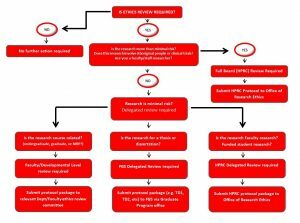 Whether your research undergoes delegated review, review via Faculty of Graduate Studies (FGS) or a full board review by the HPRC, is determined by both the nature of your research (e.g. is it minimal risk? More than minimal risk? ) and the status of the researcher (Faculty member or Student). Detailed information regarding processes and forms are listed below. All research involving human participants that is conducted by and/or involves Faculty members must be reviewed by the Human Participants Review Committee (HPRC) – this includes research led by students but with whom Faculty members collaborate. For research that is subject to review, researchers must submit their protocol and relevant attendant documents via the online ethics review system. For those researchers who are unable to access the online system, protocol submissions via email will be accepted. Please contact the Office of Research Ethics (ore@yorku.ca) for further information. NOTE: the online system is accessible to faculty researchers only. Student researchers should contact their department/graduate studies for the appropriate forms. Protocols are accepted on a weekly or rolling basis. Normally, protocols received no later than a Thursday are – barring any significant issues or deficiencies with the protocol – forwarded to the committee for review the following Tuesday. Ethics review processes vary by committee; however, in general, protocol review takes 20 working days. While ethics review is not required at the application stage (with some exceptions), as research funds will not be administered without ethics approval in place, it is advisable to submit protocols for review well in advance of award notification dates. Certain research contexts require additional ethics review processes and approvals. Specifically, but not limited to, research conducted in educational institutions, hospitals and/or medical clinics, research conducted in foreign countries and research conducted in, on or about First Nations, Inuit and Metis communities all require additional ethics review processes and/or approvals to be obtained. Guidelines are in place to assist researchers in navigating the additional ethics review requirements. Please consult the relevant Guidelines or contact ORE for further information. The review of protocols and decisions made by the relevant ethics committees are done by consensus. In the event that a consensus cannot be reached, the majority decision will be conveyed to the researcher with a notation of the dissenting opinion. Decisions of the relevant committee are communicated to researchers electronically in the form of either a letter - outlining areas of concern or requiring clarification – or a certificate of ethics approval. Should a researcher receive a letter from the committee requiring revisions to their protocol/consent documents or requesting clarification of information contained therein, researchers shall forward their responses – in writing electronically via email or online system – to the Office of Research ethics. All communication regarding committee decisions shall be via the Office of Research Ethics. Faculty members conducting research involving human participants can access all relevant forms (such as HPRC Protocol Form, Informed Consent Form Template, Renewal Application etc.) via YU Link. For graduate student research involving human participants for the purposes of completing a thesis or dissertation, please go to Faculty of Graduate Studies Research Ethics for further information and/or access to forms, guidelines, and other resources. All research involving human participants for graduate and undergraduate courses; Undergraduate theses, Independent projects and Graduate Major Research Papers (MRPs) that is non-funded and minimal-risk must be reviewed by the relevant unit level Delegated Ethics Review Committee. Research subject to review includes, but is not limited to: surveys, questionnaires, interviews, participant observation and secondary data analysis. NOTE: Research conducted by students that is more than minimal risk and /or involves Aboriginal/Indigenous peoples and/or involves clinical trials, must be reviewed by the Human Participants Review Committee (HPRC). For these types of research, students are required to complete the HPRC protocol form. Please contact the Office of Research Ethics (ORE) at ore@yorku.ca for further information. All undergraduate and graduate student researchers must complete the TCPS tutorial to establish that they have completed the necessary education component and attach their certificate of completion to their protocols. Protocols will not be accepted for review unless a valid TCPS tutorial certificate is attached. Submit the completed Protocol Package (Protocol form, Consent document(s), copies of TCPS certificate(s) and other relevant documents) (such as survey tools, questionnaires, recruitment materials etc) to the relevant Unit level Delegated Ethics Review Committee for review and approval. All Faculties/Colleges/Schools are required to form Delegated Ethics Review Committees for the purposes of conducting ethics review of relevant research ethics protocols. For those Faculties/Colleges/Schools that are larger or have multiple disparate disciplines, departmental level committees may be more efficient and effective for the review of discipline specific research ethics protocols. It is at the discretion of the Faculty/College/School to decide whether delegated ethics review can be undertaken by a single Faculty/College/School level review committee or multiple departmental level committees are most appropriate to meet their needs. However, all programs must have a committee to which it can submit protocols for review and approval. Training for all Delegated Ethics Review Committees is provided by the Office of Research Ethics at scheduled training sessions in the fall or individually by contacting ORE at: ore@yorku.ca and requesting a training session. NOTE: For graduate students conducting research involving human participants for the purposes of a thesis or dissertation, please go to the FGS website for access to forms and documents. Should you have any questions, please contact Wendy Jokhoo at x 55201 or Alison Collins-Mrakas at x 55914.